1. Heat oil in a large saucepan and fry the onions until softened and starting to brown. Add the carrots, celery and garlic and fry for 4-5 minutes. 2. Tip in 425ml of the stock, the tomatoes, mushrooms, lentils, tomato purée, oregano and paprika, bring to a boil, lower the heat and simmer gently, part covered with a lid, for 20-25 minutes until the lentils and carrots are just cooked and the liquid is absorbed to give a thick, juicy sauce. 3. Put the spinach in a large heatproof bowl. Pour boiling water over so the leaves wilt, then immediately drain in a colander and put under the cold tap. Squeeze out as much moisture as you can with your hands, then chop and stir it into the cooked lentil mixture. Season with salt and pepper. 4. Chop the potatoes into chunks and cook in boiling water for 12-15 minutes or until tender. 5. Preheat the oven to Gas Mark 6, 200℃, fan 180℃. Drain the potatoes and return to the pan to dry out briefly over a very low heat. Put in the butter and milk and mash until smooth and creamy. 6. Using a wooden spoon, beat in all but a handful of the cheese, the chives and season to taste. 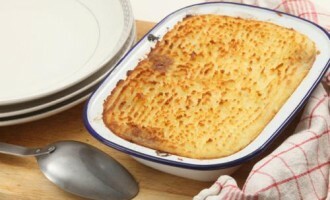 Spoon the lentil mix into 4 individual ovenproof dishes, about 600ml (or use one large dish). 7. Spoon over the mash, then scatter over the rest of the cheese. Place the dishes on a baking sheet, then bake for about 25 minutes, or until the topping is golden and the filling bubbly.